"A working example of excellence in diversity, well known as The Guitar Player's Drummer!" 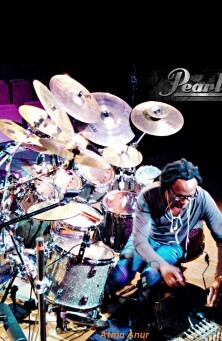 Born in London, England of West Indian parentage, Atma Anur is regarded as one of the foremost and most highly coveted session drummers in the Rock-Fusion / Neo-Classical worlds. As of March 2016 Atma has recorded 146 internationally released CDs and has logged hundreds of hours of studio time for recording projects in almost every popular musical genre. Atma Anur studied Orchestral Percussion, Jazz Performance and chart reading, Jazz Composition and live drumming performance at the Manhattan School of Music and the Berklee Collge of Music, in addition to his own private studies of world music which began in 1975 at the famous Lincoln Center For The Performing Arts Music Library in NYC. While still in NY, Atma also studied privately with the legendary William V. Kessler and many other Jazz drum set teachers in the NYC music scene. While living in NYC, Atma played mostly Jazz, Funk and Avant Garde music, in clubs and on the streets of Mid-Town Manhattan. Some of Atma's early musical liaisons include Joe Bowie, Luther Thomas, 190 PSA (Poly Rhythmic/ Poly-Tonal Avant Garde), and the legendary Guitarist/Pianist/Sax player Arthur Rhames. Atma moved to San Francisco in 1981 and began playing mostly in the California Bay Area Jazz and Fusion scenes with a great many artists that include Lorn Leber, Bill Sommers (Herbie Hancock), Steve Kindler (Mahavishnu Orchestra), Chipito Areas (Santana), Benny Reitveld (Miles Davis), Sukavat Ali Khan, to name only a fraction of the many great artists. In the mid 80's Atma officially entered the California Rock-Fusion and Progressive Rock scenes. His work in this field have become some of his most well-known performances. His relationship with Mike Varney's Shrapnel Records label of guitar-oriented music introduced Atma to the California "Shred" community. These recordings have been regarded as some of the finest and most influential instrumental music recordings of the modern instrumental era. Among the many recordings with Atma on drums for Shrapnel Records is the highly acclaimed PERPETUAL BURN CD by Jason Becker. Atma Anur is the drummer on two of the GUITAR WORLD MAGAZINE'S TOP 10 BEST CLASSIC SHRED ALBUMS: Number 9, SPEED METAL SYMPHONY by Cacophony, and Number 10, GREG HOWE by Greg Howe. Artists that Atma has played and/or recorded with in this genre include Jason Becker, Tony MacAlpine, Cacophony, Greg Howe, Richie Kotzen, Lindsey Boullt, Stu Hamm, Joe Satriani, Alex Skolnik (Testament), T.M. Stevens, Billy Sheehan, Marco Mendoza (Whitesnake), Andy West (Dixie Dregs), Doug Wimbish (Living Colour), John Goodsall (Brand X), and Guthrie Govan, to name just a few! Since 2007 Atma has been living in Europe, after having lived in the U.S. for over 30 years. Atma has recorded over a great many CDs during this short period of time, and continues to record and tour with many highly talented new, and established, European and Asian artists. Some of these excellent musicians include Daniele Gottardo, Joop Wolters, Timo Somers, Barend Courbois, Luca Zamberlin, Steve Saluto, Taka Minamino, Kenny Lubcke, Mattias IA Ekhlund, Pawel Maciwoda (Scorpions), Maryla Rodowicz, Nandini Srikar, Andy James, Jani J. Szentkiralyi and many, many more! Atma began teaching at the age of 15 while still living in NYC. He has continued in his love of sharing the joy of music and creativity for over 30 years. Atma has been a clinician for DW, PDP, Pearl and Sabian, and has taught at music schools around the world, including The John Ford School of Music in San Francisco, The Cazadero Music Camp in Northern California, The Krakow Jazz School, The Swarnabhoomi Academy of Music in India and The International Summer Jazz Academy in Poland. Atma also offers drum lessons, on line via SKYPE, and provides transcribed drum instructional material on his web site.